Sinn Féin were forced to hold an advice clinic in a caravan after a priest withdrew permission to use a Co Tyrone church hall - and the clergyman has said he will "probably not" allow the party to use the venue in future. Anti-abortion activists had planned to protest outside Fermanagh and South Tyrone Sinn Féin MLA Colm Gildernew's advice clinic at St John's Church Hall in Moy on Saturday, due to their opposition to his party's support for the liberalisation of abortion laws. However, parish priest The Very Rev John Connolly told the Belfast Telegraph that he withdrew permission for Mr Gildernew to use the church hall at the weekend. 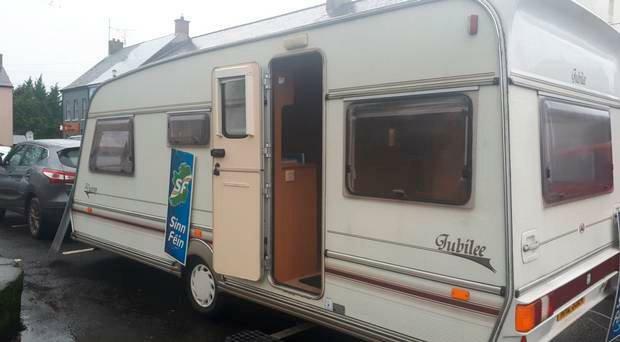 A photo posted online by Mr Gildernew on the day of the event shows a small caravan parked at the roadside in The Square in Moy, with Sinn Fein posters affixed to its doors. A picture on social media of an amended leaflet advertising the clinic, which has the words "parochial hall" removed, lists 'health' as one of the issues for which help can be offered. In Saturday's social media post, Mr Gildernew said it had been a "great constituency clinic" and pledged to "roll out the service across South Tyrone". He wrote: "Great constituency clinic in the Moy this morning. "Brilliant as always to engage with our constituents on a wide range of concerns about the Moy specifically and other issues. "We will roll out the service across South Tyrone in the time ahead to make it more accessible for all." Fr Connolly told the Belfast Telegraph he was "surprised" at the attention the advice clinic had attracted. "I didn't want to offend or annoy any parishioners, so I thought it best to call it off," he stated. "It wasn't because of any other political party's reaction. "I withdrew permission to use the church hall, it was very amicable. "I would probably not allow Sinn Fein to hold other events in the church hall. It depends what it is, I would have to look at each case as it came up." In a statement released on Saturday night, Tyrone Pro-Life Network claimed its efforts to prevent Sinn Fein from holding the meeting in the church hall had been a "total success". It stated: "Those who advocate abortion in Tyrone will be met with relentless and uncompromising opposition from us at all times. We had people in the Moy today as promised and they were finally stood down in the early afternoon when it could safely be said that our mission was completed and that it had been a total success. Our loyalty is to the One, Holy, Catholic and Apostolic Church and we will not be deflected in defending the teachings of our Faith in the matter of abortion. "We will now return our focus to the May elections and to making these as difficult as possible for those parties and politicians who support abortion." The Belfast Telegraph asked the Catholic Church whether it would allow Sinn Fein to hold any events on church property here or in the Republic in the future. No response had been received at the time of going to press. Sinn Fein also failed to respond to requests for comment.